2011/2012 Seniors | It’s that time of year again! I hated my senior photos. I regret going to a well-known conglomerate studio that charged a hideous amount of money for a very small return. Really? Twelve wallets and a really awkward photo of me leaning against a fake tree for just under $500? Sheesh… Please don’t make the same mistake I did. Seek out photos that you’ll love. If that happens to be photos from me, then I couldn’t be more thrilled! But no matter who you go to, just be sure about what you’re getting. I’m booking a very, very limited number of Seniors this year, so if you want a piece of this action, jump on it asap! 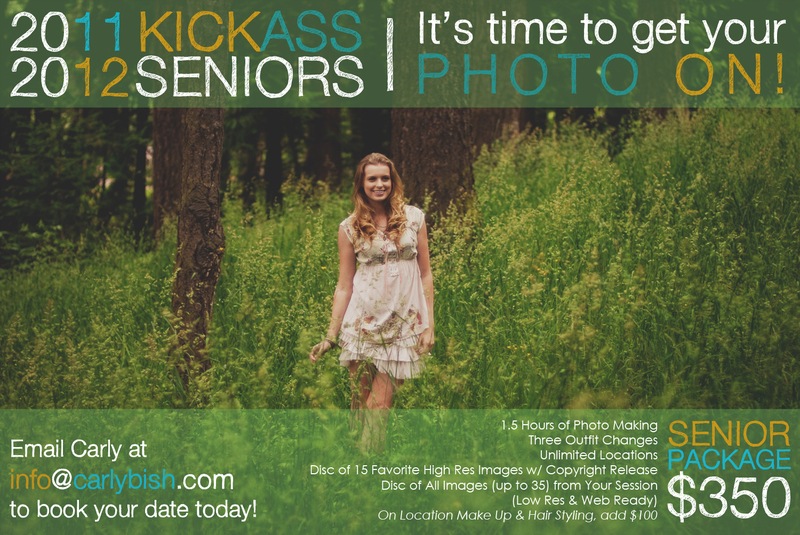 Email me at info@carlybish.com with the subject “SENIOR SHOOT” to book your date. Let’s make some photo magic!